Given that I've already written three articles about strategy games this week, I figured I might as well continue the theme going, and take a look back at a real time strategy game that would be just about forgotten to history, but I remember it so well, in part because I played it so much in multiplayer that I'm genuinely confident that if eSports had have existed back then (and Game Boy Color games were part of the mix) I would have been world champion. That game is Warlocked. 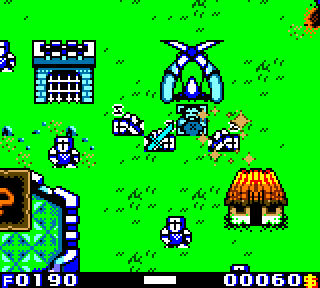 And, yes, it really was a real time strategy game that the developers had somehow managed to shrink right down to the Game Boy Color. It was very Warcraft in tone and intent; you'd play as either the orcs or humans, built up bases, mine resources, recruit armies, and then go and swamp the other side. And it had a full multiplayer mode that would let you compete with a friend, as long as you both had copies of the game and a link cable for your Game Boy Colors. The game also had fairly long campaigns for both sides, with (from memory) a solid dozen, if not more, levels on each side. 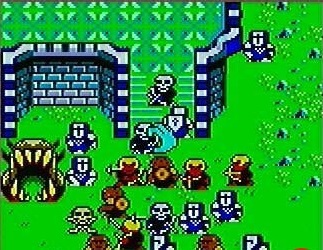 As far as "genres you would never expect to see on the Game Boy Color" goes, real time strategy was up there with the first person shooter and survival horror, so on a purely technical level, the existence of Warlocked, as a fully featured and full length RTS, is something to be admired. Now, there were limitations to the game. Of course there were. There were only three types of standard units for a start - melee, archers, and grunts (which would mine for resources, and otherwise be quite useless). Furthermore, actually commanding a large group of them in battle was a nightmare, because the pathfinding was quite terrible. If that makes it seem like an inferior strategy game, it's the two other, special kinds of units that really made the difference; firstly, there was, on each map, a Dragon's Egg. If you found it and brought it back to your base, you could hatch the most obscenely powerful unit in the game, and your side would be almost guaranteed a victory. The other special unit were the wizards. 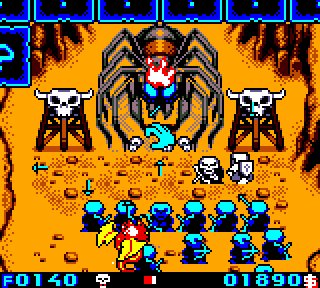 There were a lot of wizards that you could collect through the single player game by locating special scrolls. These wizards would be randomised, and it was even possible to trade them with friends, in an odd kind of Pokemon-style catch 'em all. These wizards would bring powerful effects into the battlefield, whether it would be to change enemies into harmless animals, improve the health and damage that friendly units cause, directly attack enemy units, or strengthen the defences of the buildings. The catch is that you can only have a few of these wizards on the battlefield at any one time, so you'd need to pick the right wizards for the kind of strategy you were planning to take into the game. In multiplayer, especially, this was where the real excitement of the game was. Working out what wizards your opponent was using, and then countering them using whatever wizards you've brought into the battle led to some pretty exciting moments. Because the game had fog of war (where you can only see as much of the map as you have explored), monitoring the opponent was worthwhile, so wizards that let you stealthily scout out the opponents area would give you an advantage, even if the wizard himself wasn't overly useful once battle joined. Or you might choose to play a defensive game, and use wizards that could turn enemies to your side, or boost the defensive ability of your tower. As a fairly defensive player in strategy games myself, that was my preferred strategy. My brother and I did both have copies of the game, and we spent so much time competing in this one against one another. Battle maps were fairly small, so games would be over in a decent time frame, and it made for a game that was good to travel around with. Thanks to the large mix of wizards, and the general quality balancing of the game, matches were never a retread, and throw in the generally charming presentation, and the game was rarely off our rotation for months. It's sad that the developer, Bit Studios, was not able to kick on. There was a fully-developed sequel, called Wizards, made for the Game Boy Advance, but the project was canned when the game was unable to find a publisher. I think about what could have been achieved with the Nintendo DS and 3DS... and I'm left pretty sad. There aren't enough RTS games on these consoles. Sadly I no longer have a copy of this game. I don't actually know what happened to the cartridge, but I went looking for it once, and couldn't find it again. Equally unfortunately the game never got a Virtual Console release on the Nintendo 3DS. I doubt I'll ever get to play this game again. And perhaps that's for the best. As much as I loved the game back then, and have a strong sense of nostalgia for it now, perhaps were I to play it again I would realise that I would be more aware of the flaws, or the limitations of the game by today's standards would ruin that nostalgia for me. Perhaps it's best that Warlocked simply be the near-perfect handheld game in my memory.